It’s the end of August and a chance to look back on events in which we participated. One notable event for Soccer in Slow Motion took place with FUNdamental Soccer and the Tracy Youth Soccer League. It was an opportunity to share our advanced ball control skills with the players, take part in coaching clinics, and perform a special skill exhibition with our international team. For highlights on the event click on either of the images below and see what was shared with the community. We were excited to have with us several of our top team members including the 2x Latin American Freestyle Champion from Colombia, pro freestyler from Panama, and the Bay Area’s 2x women’s street soccer champion. Groundmoves as part of warm-up skills – In Alexis’ skill demo she shared the combination of moves that are done in succession to help improve creativity and ball control. (see the 30 sec mark in the video). These combinations are an excellent way to work on balance and agility at the younger ages. And for players of all ages it is a challenge in connecting multiple moves in a fluid manner. The goal is to be able to execute combinations under pressure to be able to escape pressure from defenders or split defenders to start the attack. Bottom of the foot, a part of the foot often overlooked in practice, is one of the key parts of the foot used in the street soccer and futsal scene. It’s the touch the stops the ball under your foot and prepares for your next move. Carlin uses them in the 1m 10s mark followed by 8 year old Michael. We teach players to use the bottom of the foot for a wide range of skills, especially to pull the ball away from opponents in congested areas. 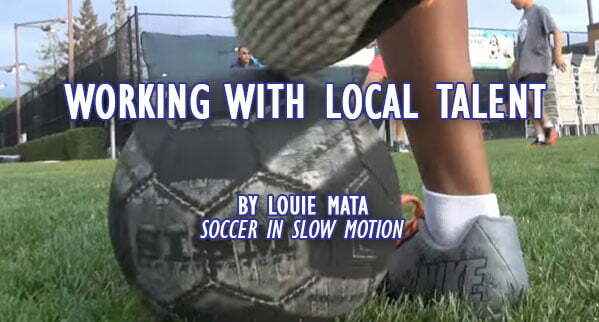 We used portions of the FUNdamental Soccer 9 Step Practice Routine in teaching these skills. Freestyle skills are a way for players to creatively work with the ball in all manners and enjoy mastering new skills. A skill as simple as the neck stall (1m 45s) is one that brings smiles to faces of all ages and keeps the practice activities engaging. Players who have learned more advanced tricks have gone on to represent some of the world’s largest companies and have performed for half-time shows, pre-game entertainment, and much more. Panna skills, also known as the nutmeg, meg, tunnel, etc. is another skill we taught at the event. Training to panna your opponent (put the ball through their legs) is much more than a fancy trick, it requires training to fully understand the benefits. From my personal experience, those benefits include improved peripheral vision, learning why opponents move the way they do, and require the learning of many combinations. Exhibitions – And wrapping up the event was an skill exhibition showcasing the wide range of skills our players/performers have from Groundmoves to freestyle tricks. The SISM players that went to Prague this past week for the World Freestyle Championships had an excellent showing. One of our players finished in the top 8 in the World and Osman (who performed the back flip in this video) finished in the top 16 in the World! We look forward to more youth club events and sharing more of the advanced skills with the Northern California soccer community!